This takes you to Paypal which allows you to pay by Credit Card or via Paypal a single gift or a monthly gift. Your donation can help us significantly to reach the nation with the gospel. Prayerline costs €300 per month to run and at the moment it is reaching over 600 individuals who have needed someone to stand with them in prayer in difficult circumstances. We have set up a ‘Silent Sponsorship’ where churches or individuals can pay a one off payment of €300 to cover the cost for one month. Would you or your church consider supporting this aspect of the ministry? Silent – because it is not about us, or the church that sponsors but all about the individuals that need a touch from God. We will however, contact the sponsors to let them know how people have been supported during their month of sponsorship. 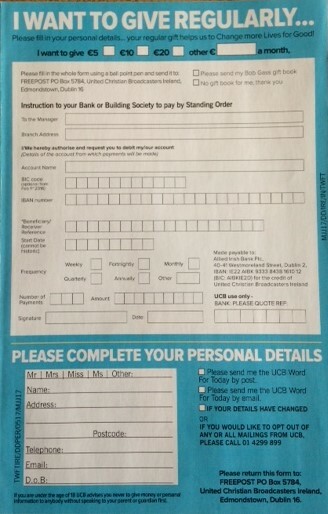 If you want to make a one-off donation by post please make cheques and postal orders payable to UCB Ireland.